What I love: Both Elijah and Ariel LOVE dinosaurs. Like seriously they can't get enough. They watch and play anything they can get their hands on dinosaurs. 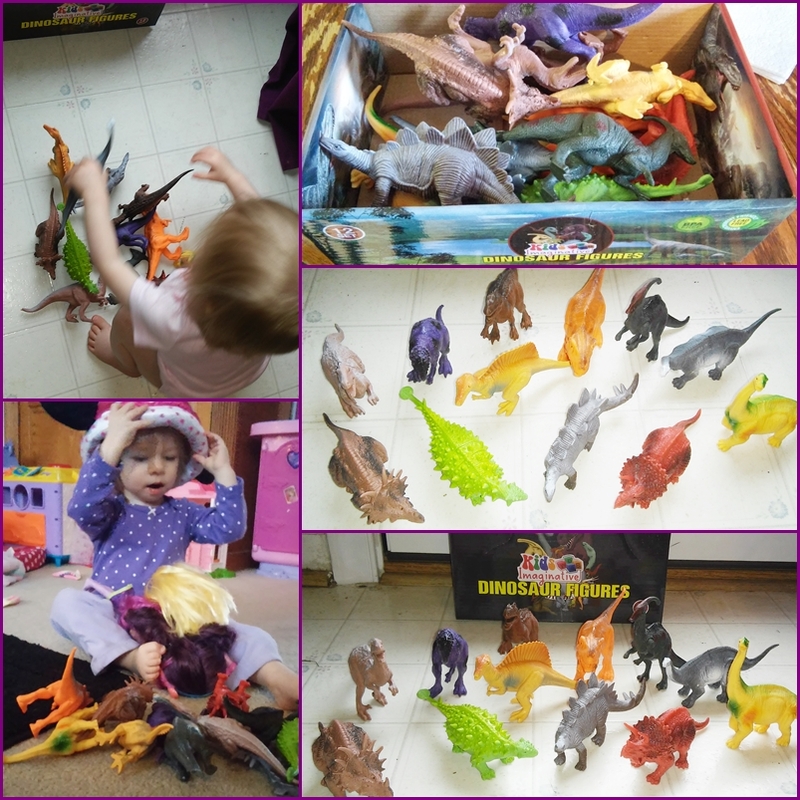 These Kids Imaginative 12 Dinosaur toys are exactly what they needed. They came in a nice box, perfect for keeping them in when not in play, which with my kids is never. Each dinosaur is one solid piece of lead and BPA free plastic, so there are no tiny removable parts or worry of them breaking. There are also no sharp edges. They are very solid and durable construction and I know these toys are going to last through rough play with them both with no issues. The paint varies from dinosaur in color range from shades of blue, pink, yellow, green, brown, silver, red, and purple giving them a really neat look. The paint is even and not cheap looking like some of the other dinosaur sets we have looked at. Every dino is a pretty good size, from 5"-7" from nose to end of tail. Way bigger than something they could put in their mouths or lose while playing in the sand and water table with them. The Dinosaurs Species included are all very detailed and look true to other media, T-Rex, Stegosaurus, Triceratops, Apatosaurus, Ceratosaurus, Spinosaurus, Tyrannosaurus, Pachycephalosaurus, Parasaurolophus, Brachiosaurus, Styracosaurus, Velociraptor, and Euoplocephalus. They all can stand up on their legs perfect for play and are super fun with their other toys too whether they are stomping into our minecraft land, up on the train table, or even playing in the princess castle with the dolls they find a way to blend in! Especially for the price these dinosaurs are fantastic value! I saw a similar set at a toy store with not even 1/4th the quality and only 7 dinosaurs for $39! I can't believe how we lucked out into finding this set! It's perfect! I highly recommend it! Check out my video below of Ariel playing with them!